If you want to feel like a player for a day, the Camp Nou tour gives you the chance to go behind the scenes and soak up all the action from a player’s perspective. As well as giving you instant access to all the good stuff – we’re talking dressing rooms, the player tunnel, and the mighty pitch itself – the Barcelona stadium tour also gives you access to the FC museum, where you can learn all about the history of the club. The tour itself is self-guided, so you can spend as long as you like browsing the player bios and walking in the footsteps of football superstars. As you make your way through, bright yellow barriers etch out the way for you so you don’t miss a single thing, and there are attendants on hand to help you out if you get lost. Information is dotted around on boards along the route, but you can also pick up a guided tour for that extra oomph (see the tickets section for more information). There is a lot to take in on the FC Barcelona tour, so expect to spend between 1 and 2 hours exploring the team’s past and present. Along the way, you’ll get to build up the backstory of the Barcelona team, and learn more about its players, successes, and what life is like at the stadium for the team. At the start of the tour you’ll be party to a 10-minute 3D extravaganza that places you, the visitor, in the much-coveted position of player. The experience is supposed to give a sense of what it’s like for players when they’re on the pitch, with replays of famous matches and accompanying sound tracks to provide the full flavour. One of the stop-offs of note is the in-house chapel, which was opened in 1958 and blessed by Pope John Paul II in the early 80s. Since then, it has provided a safe space for players to send up last minute prayers before they hit the field. Perhaps the most interesting element of the tour is the museum, which is home to wall-to-wall trophy cabinets, player bios, and historic photos of team successes. Here, you can delve into the narrative of FC Barcelona through a collection of fun, interactive displays and eye-catching wall displays. Yes, there’s an entire space dedicated to the Argentinean superstar. You can marvel (or look on in puzzlement) at Leo Messi’s 5 Ballons d’Or and his 3 Golden Boots while watching a montage of his best goals that play out on the walls. Despite its undeniably football-focused ambiance, the stadium is also home to a collection of trophies from other Barcelona sports teams – a fun way to get an overview for the city’s entire sporting scene. Many a confession has been made and many a question been diverted in the stadium pressroom. This is where much of the post-match activity takes place, with players justifying their failures and bigging up their successes. You can sit in the same seats as the world’s best-loved players, or check things out from the press’ perspective. Unfortunately, you can’t wander into the FC Barcelona dressing room, because it’s constantly in use by the players who leave their stuff there on the regular. This is a shame, really, as apparently it’s decked out with a spa, treatment room, and pharmacy. Instead, you’ll have to make do with checking out the visitors’ dressing room, which has seen hundreds of global teams pass through its doors. This is where things really start to get good. If you shut your eyes (or keep them open and use your imagination), you can almost pretend you’re about to emerge on the pitch to play with one of the world’s most beloved teams. The tunnel inevitably leads to the field, which is pretty impressive up close. Here, you can look out over the 105m by 68m pitch and gaze up at the 48m high stands (squint hard enough and you can almost see the 100,000 passionate fans cheering and jeering). This is where the Benches are (or the “Dug Out” area), where you can sit in the same seats as the managers. Get your commentary on in these raised boxes that have seen hundreds of TV and radio stars work their fast-lipped magic. While you’re wandering around, don’t forget to look out for Miro’s lithograph, which was made especially for the Barcelona football team, and the 5-star plaque that was awarded to the stadium in 1999. Ready to buy your Camp Nou Tour tickets? Here is all the price information you need to know. The easiest way to buy tickets is online, because you can beat the queues at the stadium. Once you’ve booked, you’ll need to print out your confirmation and hand it in at the entrance of the stadium. You’ll need photographic ID to prove that you’re the person who bought the tickets. You don’t need to reserve a time or day when booking. The stadium is open throughout the year apart from the 1st January and the 25th December. You can take a tour between 10am and 6.30pm, with last admittance at 5.45pm. 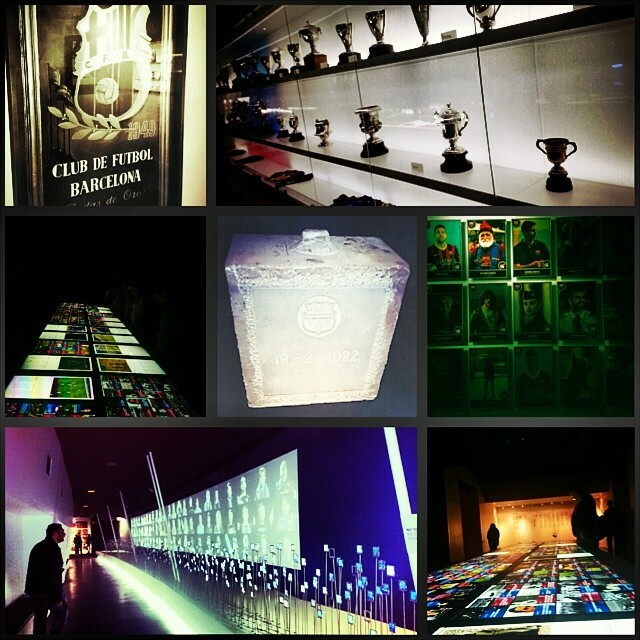 On match days, only the museum is open to the public, including the trophy room and Messi Space, but you can also get a panoramic view of the pitch up to 3 hours before kick-off. Note: It’s worth checking online to see if you’ll be able to access all areas before you make the journey to the stadium, as there are often unexpected changes to the schedule in training season and for miscellaneous events. You can also pick up an audioguide at the start of the tour, which will offer additional information to the wall panels as you go around. Audioguides are available in a range of languages, and are self-paced so you can go with the flow. Note: You’ll be asked for ID as a deposit when you pick up an audioguide, so it’s worth taking a driving license or a bank card so you don’t have to part with your passport. Alternatively, you can buy tickets at the stadium from the automatic ticket machines or from the on-site ticket offices. These are often subject to queues, so be prepared to wait around. You´ll receive your ticket via email.